A clean housing is important for the sealing properties of a new packing. For this reason used seals must be carefully and completely removed from the sealing box. Packing extractors were developed for the rapid and careful removal of packings. 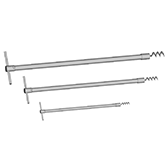 The forged, helical-shaped tips are firmly joined to the extractor shaft. With their large pitch, they can easily be screwed into all types of braided and fabric packings. With the flexible and powerful shaft, even difficult to access packing gland boxes are easy to reach. The T-bar handle is designed for the tensile load and sits easily in the hand. Packing extractors sets are supplied in a practical case. Each set contains each size of steel extractor: 22 cm, 33 cm, 44 cm long for packing boxes from 6 mm, 10 mm and 13 mm width. For the installation of packings, metal ring segments can be screwed onto the extractors and in this way they become the ideal tool for pushing the packing rings evenly into the housing without damage.